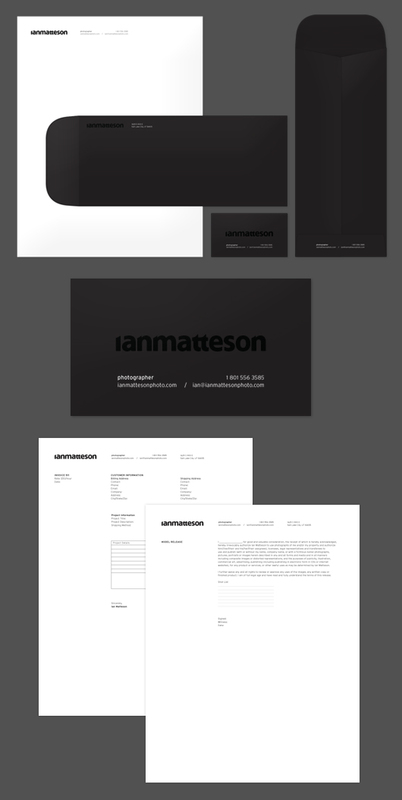 Process: Branding Ian Matteson | Shelby White - The blog of artist, visual designer and entrepreneur Shelby White. This project, brand and identity development, was for long time friend and photographer Ian Matteson. Ian is an action and commercial based photographer out of Salt Lake City, Utah. Along with Ian’s action and commercial work, he shoots a lot of film/fine art photographs. As the project progressed, I realized just how great it would be to incorporate these other areas into core components of his brand. We both have put in endless hours working on this project and really are excited to have this portion of it completed. Our first main objective was to develop an identity for Ian that really complimented his style of photography also keeping his long and short-term goals in mind, while at the same time, enabling him to stand out among others in the photography industry. After talking about these goals we came to recognize that simplicity was key in this case. We needed people to remember his name through his work and needed to be unique in the way that we were doing it. A brand that was cohesive would in itself set Ian apart from his competition. Before diving into headfirst into the design, Ian and I sat down (mostly via iChat) and researched current and past photographer logo trends. Based upon our research, we saw a pattern. 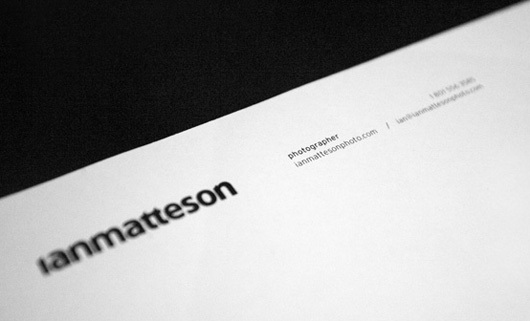 It showed that generally the more successful photographers opt to utilize their name as their logo. 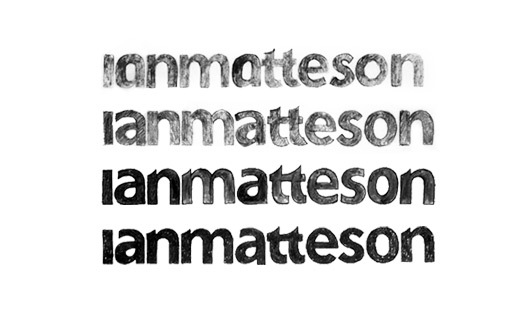 In some cases, Ian’s competition also did this, but completely lacked the visual stability throughout their brand and the uniqueness of the logotype. The few sketches above show alleys that were explored. Although my initial icon sketches didn’t make the cut, they still provided a point in which I could look at how an icon could assist or take away from the main logo. This was the point where we really questioned tradition and steered away from using an icon. There would be no case where Ian would need to use one and going back to our original goal: We want people to remember his name–not an icon. Once the direction was established for the logo, I began to use tracing paper over my round two sketches. Have you ever used tracing paper for logos? I find it to be a huge time saver when repeating sketches over and over. 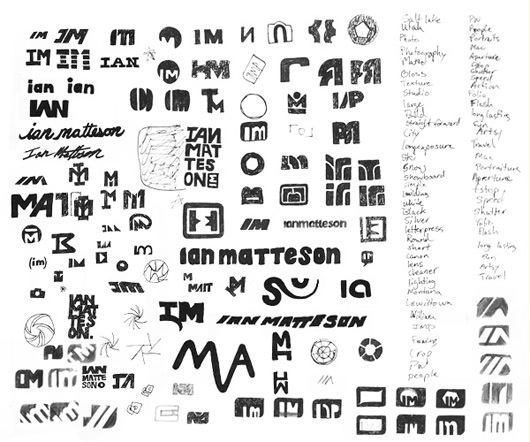 After hashing out several versions of the original sketch, I visited the personality of each letterform. The biggest issue I saw with using just logotype as the main logo was that we really needed it to sing. Ian is such a character that we really needed it to do him justice. The beautiful hand drawn type and driving idea of simplicity fit perfectly into the recipe that both Ian and I were envisioning. Selecting color was a no brainer for this project. The use of a highlight color deemed inappropriate for this logo considering there was no icon to utilize a seconary color. Also, to add a secondary color to the logo would ultimately take away from our main goal and lastly, it would cause problems when using the logo as a watermark directly over color images. The solution for the color scheme was to bring in Ian’s film and fine art look to enhance the brand. We focused on what imagery would be where and on what application (print or web). In the case of printed materials, the type and logo will be black on white with the exception of the business card (black on black). The website however, will use white text on dark imagery. This is where we really bring in Ian’s work. All of the images that require a substantial amount of text overlaying them, are greyscale like in the above diagram. The other imagery are portfolio works that have no overlaying text. To create the base colors I blurred out images until they only viewable as splotches of color. Another way to do this is to select your image and use the mosaic filter in Photoshop. I hadn’t used this method prior to this project, but it really helped narrow down the amount of greys, whites and blacks. 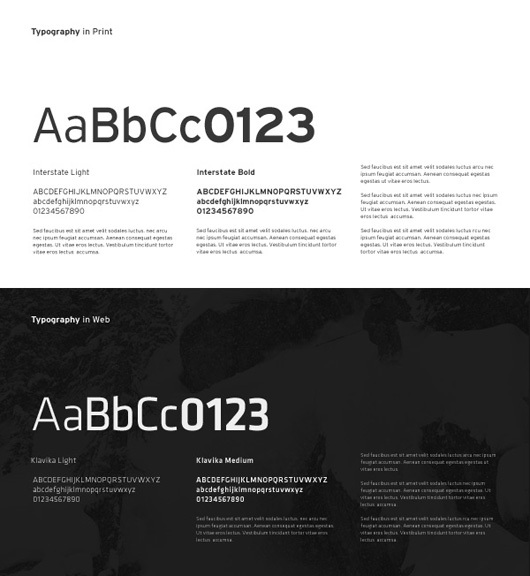 The typefaces used throughout the collateral pieces absolutely enhanced this project. Interstate was used in the printed material as it bonded beautifully with the final logo; the angular design of each letterform also complimented Ian’s action photography. For online collateral, we utilized Klavika. Once again the type reflected the work by both the angular and rounded letterforms. Even though there is becoming less and less of a need for a printed business cabinet, we still felt like it was absolutely necessary. Ian still needs to present himself to clients whom aren’t fully immersed in the digital age. 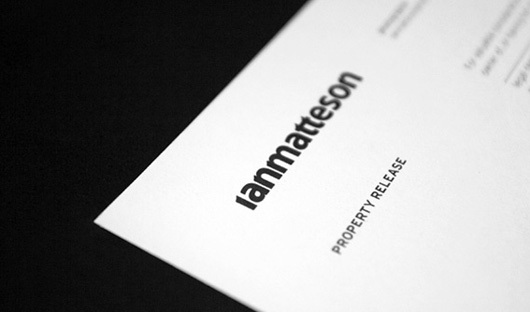 In addition to the traditional business papers, I designed templates of Ian’s business papers as an extension of the identity: Invoice, Contract, Model and Property Releases. This project has been awesome to work on and the end result is something we’re proud of and thrilled to have it out on the table for viewing. The whole visual aesthetic and logo fit exactly to who Ian is as a photographer. Not to mention Ian is in love with his new look. I hope you enjoyed this post and feel free to chime in if you have something to say. Great representation of your process, I love it when designers do posts like this. I think that’s why i find behance so inviting. It is about the process and the core root of there inspiration. I love the outcome, even though it is simple and a name, the style and type sets him apart. Shelby I love your work, hands down top notch. LEGIT!! You know I love it when you show your sketches. I’m a big fan of simple and clear. Nice work. Think I’ll show it to the class tomorrow. Awesome work so far! I love the logotype, it absolutely does fit more comfortably than some sort of logo/text combination. Also really like the paper correspondence– it is definitely still a necessary asset, especially for those invoices/contracts, which should look wonderful in both printed and web form. What’s always interesting when seeing other peoples sketches how far apart the final logo can be to all the main focus of the sketched ideas. Love the fact you initially focused on logomarks, and tried many variations before abandoning that idea and focusing on a logotype. Which I must say is beautiful. The print work also looks stunning. Nice work. Wow, I love’d actually being there an seeing the different stages this went through to get this finished post, It reminds me how important it is to push your idea to its fullest! That is an impressive amount of sketched initial ideas for the logo! The end result is really great so looks like the hard work was worth the effort. Thanks for sharing, excellent use of typography and an excellent article too. HI MY NAME IS RAJEEV MATHUR AND I THINK THAT IS AN IMPRESSIVE AMOUNT OF THE LOGO. 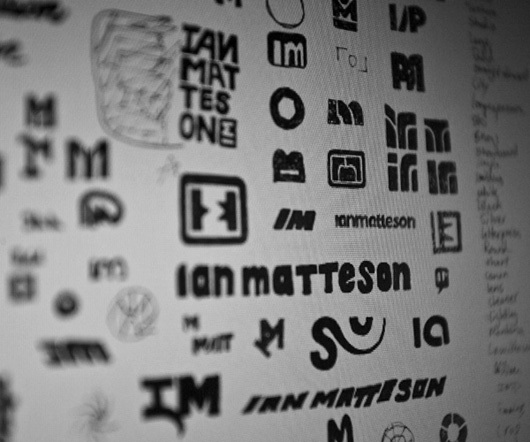 Thanks for going through the design process for the Ian Matteson logo, Thanks! Awesome work. No idea how I originally stumbled across your blog but I’m hooked. 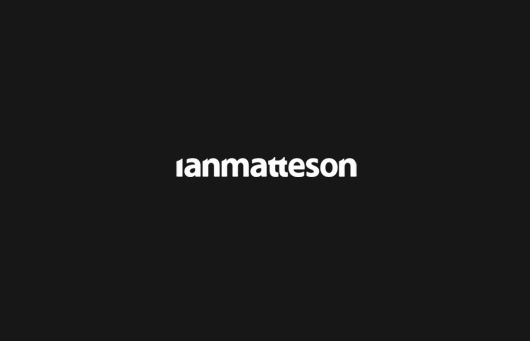 What is the font you used for Ian’s name? It’s a great. this web site, it contains useful Information. Certain buildings like the mills were especially prone to fire outbreaks. you’re after, metal building and supply we should be able to add space for personal or even professional use. workshops with steel building prices. well, ?eep u? the good work fellows. certainly like your website however yyou have to take a look at the spelling on several of your posts. to inform the reality however I will certainly come again again. of the nutrients it needs. ” Slimple’s™ scientists searched the globe for natural ingredients that met the company’s high standards for weight loss efectiveness and healthfulness. The Weight – Watchers mobile app for Black – Berry is great at this. Wow, suh a helppful website. website link on your page at appropriate place and other person will also do same for you. I’m asked, continually, for help with people’s gardens. Do you want to eat outside in your outdoor kitchens Arizona. begin with a business plan.